Brandbury Ltd T/A Dreamtyme 63/67 Bolton Road, Bury, BL8 2AB, United Kingdom. 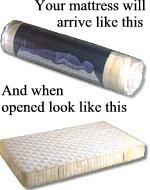 Here is a selection of our single mattresses, all are super quality. They are generally arranged in price order. If you want more information about any of them if you look to the left and fin the relevant manufacturer and model you will find more information there, as we have tried to keep this section as simple and as uncluttered as possible. The Original Ultra Firm Relaxsan in standard British single size which is approximatley 3`0"x6`3". 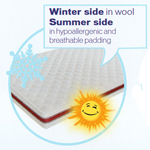 Relaxsan Original Deluxe British Single size which is approximatley 3`0"x6`3"
Relaxsan Vision Mattress in standard British single size which is approximatley 3`0"x6`3" and is very firm and supportive. 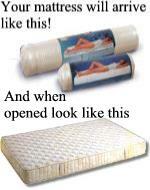 Relaxsan Waterlattex in standard British single size which is approximatley 3`0"x6`3". 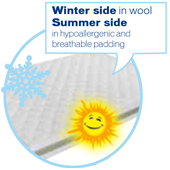 Waterlattex Vision Deluxe Single 90 x 190 Mattress UK 3`0" x 6`3"
Relaxsan Orthosoft super supportive mattress in standard British single size which is approximatley 3`0"x6`3". 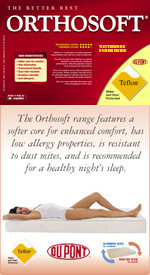 Relaxsan Orthosoft Vision mattress in standard British single size which is approximatley 3`0"x6`3". 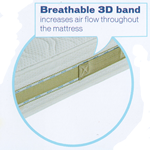 Orthosoft Vision Deluxe Single Size Mattress 90cm x 190cm which is equivalent to UK 3`0" x 6`3"
Concept Memory Premium 2000 Mattress Single 91cm x 190cm which equates to 3`0" x 6`3"
Concept Memory Premium 3000 Mattress Single 91cm x 190cm which equates to 3`0" x 6`3"
Concept Memory Premium 4000 Mattress Single 91cm x 190cm which equates to 3`0" x 6`3"
Top quality British made Metal Bedstead.